I swear this blog isn’t just a repository for my own, personal drink recipes. This recipe is more of an adaptation than a wholly original drink, anyway. 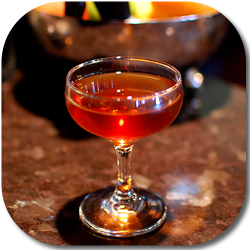 During his exhaustive stomp through the Savoy Cocktail book, Erik Ellestad came to the “W’s” and posted the recipe for the Whist Cocktail. Apple brandy, rum and sweet vermouth sure seemed like a tasty mixture to me. I was immediately intrigued and caught up with Erik via instant messenger. RumDood: So the Whist – is good or is meh? Erik: Could use some bitters and maybe a twist but if you like that sort of thing, tasty. Well that sort of thing is well-liked in my neck of the woods, so I set about trying the recipe at home. Erik was certainly correct: the drink could definitely use something. Bitters, maybe a twist, I wasn’t sure – but no one I made the drink for was blown away by it. The Whist mostly garnered responses of “interesting,” which to my way of thinking is pretty close to damning with faint praise. I’ll confess that I did not do an exhaustive search of apple brandies to locate the perfect one for the Whist. Believe it or not, here at RumDood headquarters we do not have a large number of apple brandies at our disposal, and honestly I think the appeal of AppleBrandyDood.com is probably even more limited than that of this site. I opted to add some punch via other means. I grabbed my trusty bottle of Laird’s Bonded Applejack and the reigning King of Hogo, Smith & Cross rum instead of the drier Spanish varieties and started running through variations until I settled on something with a good apple flavor riding just on top of the deep funk of the Smith & Cross. I settled on the name English Ruff as an homage to the progenitor drink’s name. Whist was a popular English card game in the 18th and 19th Centuries and is related to Trump and a game called Ruff & Honours. In the 17th Century, Charles Cotton described a card game with similar rules to Trump and Whist in The Compleat Gamester as French Ruff (he also dedicates a significant amount of space to the actual game of Whist). As I have nothing French in the cocktail, I figured I’d swap out “French” for “English” and viola! I actually debated for a while whether this should be its own cocktail or if – like my alterations to the El Presidente – this was a mere “adjustment” to the original cocktail. The differences between the kind of rum and the addition of gomme and apple schnapps convinced me that this drink was sufficiently different to be its own entity. Maybe some will disagree with me on that point. One thing I have yet to have anyone disagree with me about is that this drink is delicious. How much does a drink recipe need to be changed before meriting its own name? If you can get your hands on some, Clear Creek’s 2-Year Apple Brandy is incredibly tasty and pretty cheap. Unfortunately it’s not quite as stiff as the Laird’s Bonded, but it does have a really rich flavor of ripe apples. Well, I’m a Calvados booster, myself. Sounds tasty, Matt. I now have Punt e Mes, so I’ll give it a try tonight! If the drink is a riff why not riff on the name too? I suppose it all comes down to how broadly defined the original recipe is. (e.g. It’s still chicken soup when I change from egg noodles to alphabet pasta). Dagreb: That’s sort of the central issue that I feel I get caught in any time I start tweaking someone else’s recipe. The naming of recipes is somewhere that mixology and cooking diverge. If someone makes their grandmother’s lasagna, it’s still just lasagna – regardless of how much garlic, tomato, or basil there is and regardless of whether or not they’re adding something like red wine or even sweet vermouth or lemon zest to the sauce. When it comes to drinks, changes like that are often all it takes to really create a new drink according to precedent. 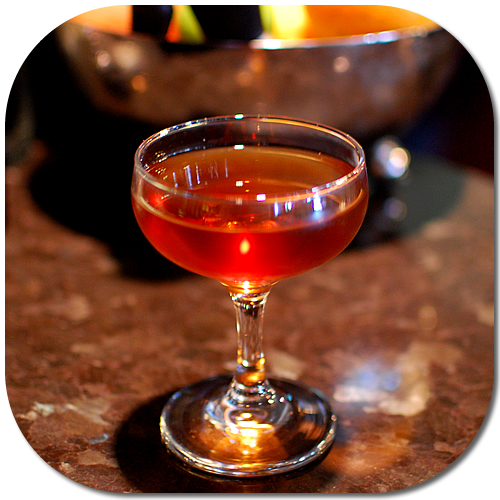 Take a Martini and swap out the sweet vermouth for dry vermouth and you have a Martinez, not a Martini. Make a daiquiri, but use darker rums and add a little orgeat for flavor. What do you have? Grandma’s Daiquiri or are you almost at a Mai Tai (still missing the curacao)? As far as riffing on the name, I’m actually a big proponent of that. It honors the drink’s lineage and can give people an idea of what they’re getting. I tried to do that by going with English Ruff, but perhaps something like Whistful Smile or Modern Whist would have been better. Or maybe this drink really is still a Whist. These are (sadly) the things that keep me up at night. Well, it looks great and it is definitely something I would drink. I guess you can change the ingredients as many times as you wish before giving another name to the drink. Anyway, this one sounds pretty good. Great recipe! Thanks for post. Your rum reviews are in large part responsible for the rum part of my liquour cabinet being the largest shelf.